Niche line Bond no. 9 will launch Queens in September. The new unisex tuberose scent was inspired by the New York City borough and Queen Catherine of Braganza, for whom the borough may or may not have been named. Queens was developed by perfumer Laurent Le Guernec. The notes include bergamot, cardamom, blackberry, tuberose, champaca, osmanthus, sandalwood, benzoin, musk and amber. Bond no. 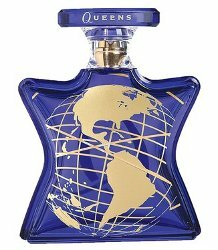 9 Queens will be available in 50 ($195) and 100 ml ($270) Eau de Parfum; the bottle design features "a gold rendering of the 1964 World’s Fair Unisphere". I’m a big tuberose fan…would certainly try it! This line hasn’t done much for me so far. Not even Chinatown..which some ppl seem to like. Ugly bottle too. I’m late in the game here, but I keep getting an advert for this on my pages. Probably because I recently moved to Queens and IT knows! Before reading the notes, I imagined that if you wanted to capture the diversity in this borough, it should smell like curry, kimchi, and fish sauce, and some cilantro for good measure! Tuberose doesn’t come to mind. I haven’t really been into anything from the line that I’ve smelled so far. Wondering how this one turned out.